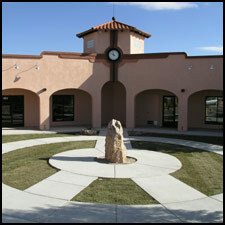 The Old Town Plaza is located at intersection of Nevada Way and Arizona Streets where they form an acute angle and a natural focal point for the central business district of Boulder City. This pivotal site was previously occupied by a deteriorating gas station. 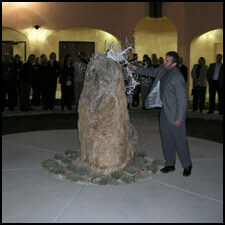 The parcel was purchased by the owners of City Center Plaza, located across Nevada Way from the site. It was their desire that the design provide for a “park like” setting for the new building that would be home to The Boulder City Chamber of Commerce and additional commercial tenants. 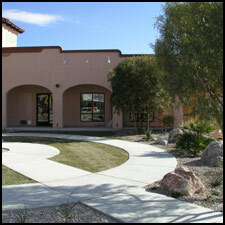 The basic exterior design elements of the building are drawn from other buildings within the historic district to provide a sense of time and space continuity. 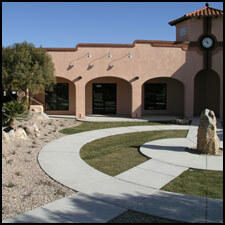 Mr. Stromberg previously designed remodels of two the adjacent buildings in the block utilizing the same concept. The dramatic location of this building demanded a central design feature that would provide an element of visual importance consistent with the architectural design context of the nineteen thirties. To achieve this Art Deco parapet lines were designed to step skyward to the centrally located “Clock Tower”. 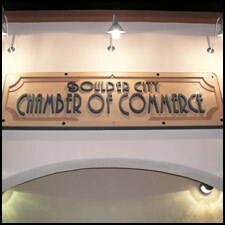 With the Chamber of Commerce located in this building it will serve as a first impression and starting place for visitors exploring the unique environs of historic Old Town Boulder City.